Human-like holder plays an important role in identifying actual emotion expressed in text. 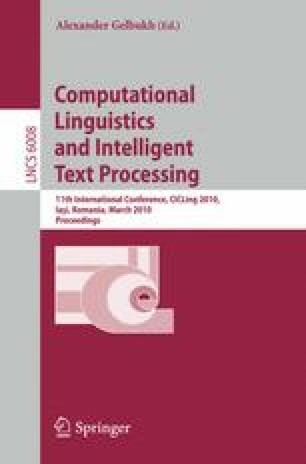 This paper presents a baseline followed by syntactic approach for capturing emotion holders in the emotional sentences. The emotional verbs collected from WordNet Affect List (WAL) have been used in extracting the holder annotated emotional sentences from VerbNet. The baseline model is developed based on the subject information of the dependency-parsed emotional sentences. The unsupervised syntax based model is based on the relationship of the emotional verbs with their argument structure extracted from the head information of the chunks in the parsed sentences. Comparing the system extracted argument structure with available VerbNet frames’ syntax for 942 emotional verbs, it has been observed that the model based on syntax outperforms the baseline model. The precision, recall and F-Score values for the baseline model are 63.21%, 66.54% and 64.83% and for the syntax based model are 68.11%, 65.89% and 66.98% respectively on a collection of 4,112 emotional sentences.